Open All Year... The Divani Palace Acropolis Hotel, true to its tradition, warmly welcomes its guests with a promise of satisfying the needs of even the most demanding traveller. At the Divani Palace Acropolis you will experience the true warmth of Greek hospitality. 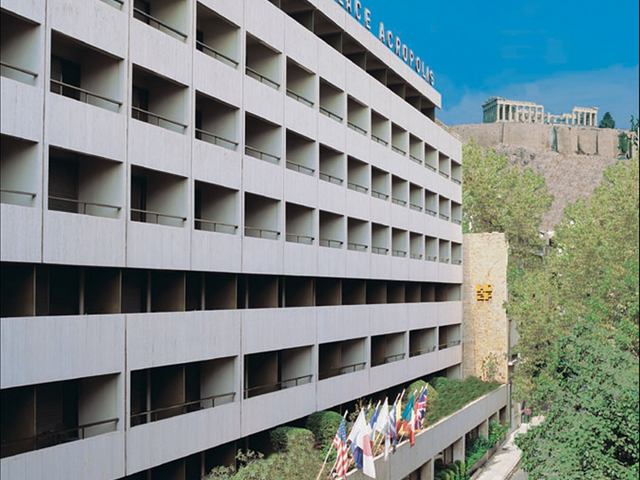 The Divani Palace Acropolis is a five star deluxe hotel completely renovated during 2002. The Hotel offers two large lobbies, very elegantly furnished anddecorated, one at the entrance and one towards the other wing of the hotel. Both of them have access in the garden and the swimming pool. A unique feature of this hotel is the ancient ruins of Themistocles wall, discovered in its foundation and tastefully incorporate in the Hotel’s architectural design. The Divani Palace Acropolis Hotel, true to its tradition, warmly welcomes its guests with a promise of satisfying the needs of even the most demanding traveller. At the Divani Palace Acropolis you will experience the true warmth of Greek hospitality. Within a few minutes you can be shopping or visiting intriguing Plaka and enjoying its fantastic nightlife. The Divani Palace Acropolis Hotel is situated at the foot of the Acropolis, with a magnificent view of the Parthenon Constitution Square, with the changing of the Guard and the area of Plaka with its picturesque, narrow, winding streets and charming boutiques are within close range. The Hotel's location offers quick access to the Port of Piraeus, where cruises and ferries depart practically to all the Greek Islands. The Hotel is easily accessible by various means of public transportation, including the Subway (Metro) or the Hotel's free Shuttle Bus every 2 hours to Syntagma Square. The Divani Palace Acropolis’ dining choices can accommodate every taste and occasion – from a casual drink by the pool to a full scale banquet on the roof in regal style. Accompanied by the highest level of attention, served in the most breathtaking of settings, our on-site restaurants are sure to please. If you prefer to enjoy your drink or a light meal by the swimming pool, we provide the Pool Snack Bar. A casual atmosphere and great food make for a memorable day at the pool.